Chisel Scalers designed to be easy to use and maintain. 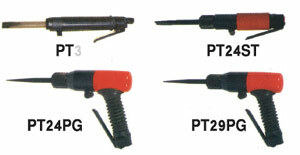 These Chisel Scalers are ideal for removing layers of paint, corrosion, chemical coatings etc. from metal and non metal surfaces and for general purpose chipping and scaling. many different chisel options are available.